The leading Japanese English Dictionary & Translator for Android Phones and Tablets. 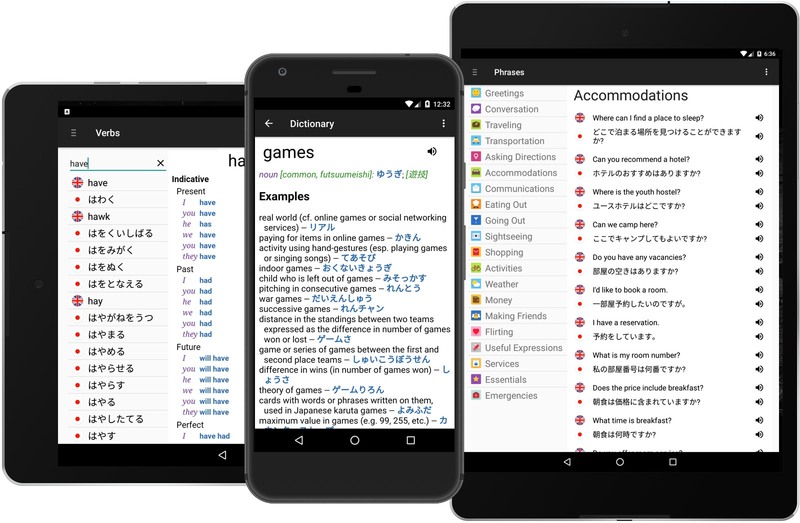 Advanced features and extensive content make VidaLingua the most comprehensive Japanese English Dictionary & Translator for Android Phones and Tablets. I am a third year student of Japanese. I tried a few free Japanese dictionaries and found this one to be the best. Not only for the comprehensive dictionary but also for the verb conjugator and phrasebook. " A necessity when trying to immerse yourself into a language. Thank you for all the help! " Easy to use. Useful Japanese translator. Nice app! " Japanese English Dictionary with hundreds of thousands of offline entries. Includes translations, parts-of-speech and usage examples. Twenty categories such as Conversation, Asking Directions, Eating Out, Flirting and Making Friends. Search on key word. Hear phrases pronounced in Japanese or English. Conjugations of thousands of Japanese & English verbs in all major moods (Indicative, Volitional, Presumptive...) and tenses (Affirmative, Negative). Text-to-speech pronunciation of all dictionary entries, translations, usage examples, phrases and verbs. Translate complete sentences from one language to another (requires internet). Hear translations pronounced in Japanese and English. Language is living! Only VidaLingua allows you to add notes and images to the dictionary. Japanese English Dictionary & Translator + is an engaging travel companion, enriched by your learning experiences.